A collection is a set of pages that are linked to one another and have the same access permissions. You can create as many collections as you like, but a page cannot appear in more than one collection. You can create a collection from scratch or copy an existing one - either one of your own or one from another user that is copyable to you. 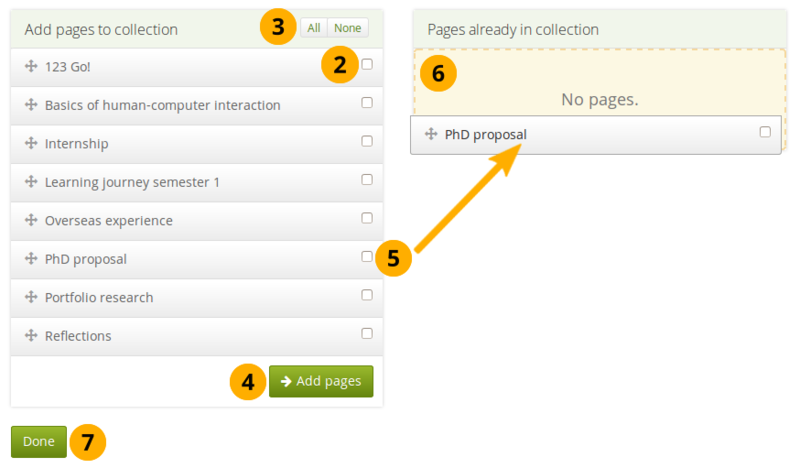 When you are on the overview page of the collections, you can do several things. Create a new collection by clicking the New collection button. Copy an existing collection by clicking the Copy a collection button. If you have the link to a collection that you are allowed to copy, you can click the Copy button directly there and don’t have to search for the collection first. When you submitted a collection to a group, you cannot edit or delete it until it has been released. You see submission details displayed. You see the collection description. to move pages within a collection, add them to or delete them from a collection. 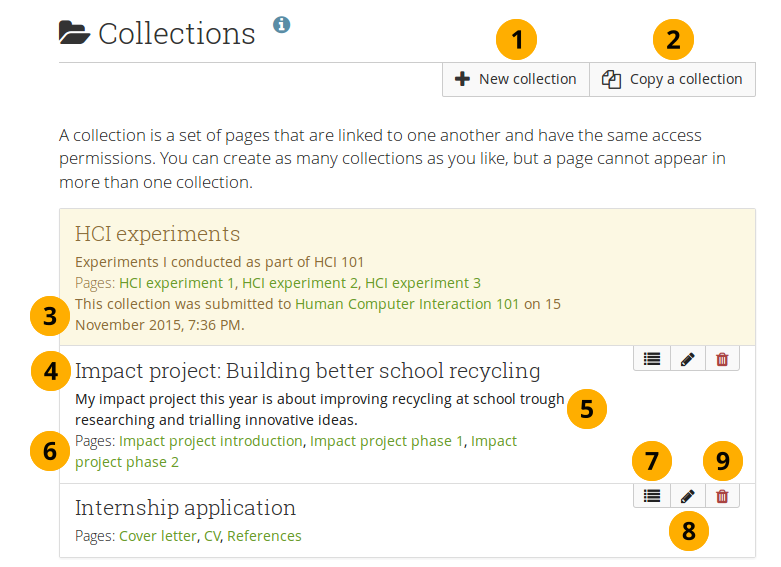 You can see up to 10 collections on the collections overview page, and then use the pager to move to other collections. 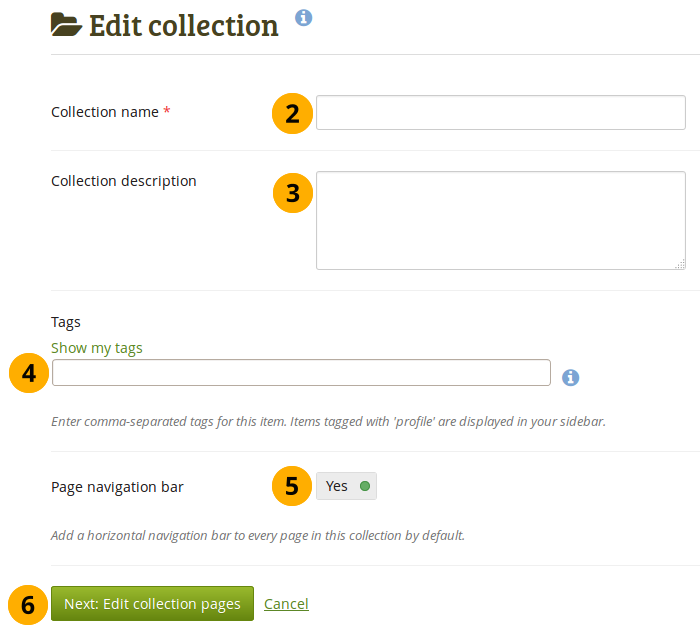 Tags: Enter tags to find your collection more easily at a later stage. Separate your tags with commas. If you already have tags, you can click on the link Show my tags and select the ones that you think will fit for this collection as well. They will be entered into the text field for you. You can duplicate your own collections or collections of other users if they allowed you to do that. As every page can only be in one collection at a time, your own pages will be copied when you copy a collection. The sort order on the screen is according to collection titles in alphabetical order. to copy one page only into your own portfolio. Edit the collection and its pages as you would do any other collection and pages. 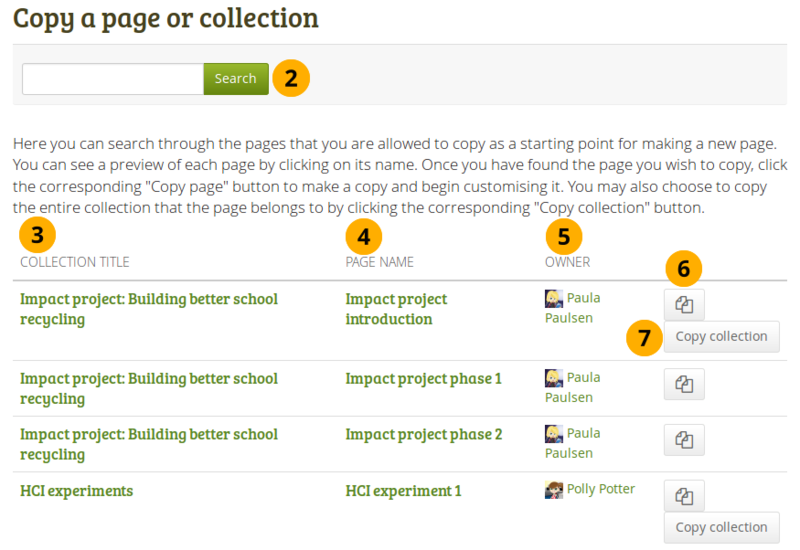 The site administrator can decide to add “Copy of…” for copied pages or collections. This setting needs to be made in the config.php file. If $cfg->renamecopies = true;, copies of new pages and collections will have “Copy of” prepended to their titles. The default setting is $cfg->renamecopies = false;. If the page is part of a collection, you need to decide in the pop-up window whether you want to copy just the page that you can see currently by clicking the Page button. Or whether you want to copy the entire collection by clicking the Collection button. Edit the page or collection as you would to any other.